Our first two trips to Brugges in Begium were stop offs whilst coming and going to Germany, the first was for 2 days in September 1997 and the second for 4 days in June 1998. Our last visit in June 2005 was a deliberate detour for a two night stop over. 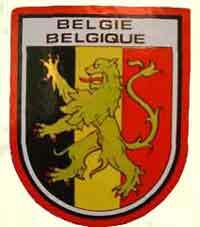 We love Brugges and will stop there at any opportunity. On all occasions we have stayed at Camping Memling, about a mile and a quarter from the center. This is a small quiet level site set in woodland 300 yards from a supermarket and next door to a heated indoor swimming pool. We use the cycleways to walk into Brugges. 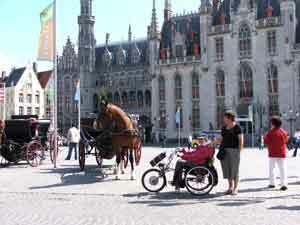 Cobbled streets can be problematic for a wheelchair user but it is well worth the effort. Toilets for the disabled can also be a problem but we found some at the bus station. The canal trips are not wheelchair friendly and it is a tough carry on and off task to board and alight from the small boats. On our second visit we took the electric scooter and my bicycle. The bicycle is very useful for quickly surveying the local area and finding wheelchair friendly routes and places. On this occasion we used the cycleway to go to Damme for the day, catching the canal ferry which had easy wheelchair/scooter and bicycle access back to Brugges. In June 2005 we noticed more provisions for the disabled have been made, notably many busses were wheelchair accessible but unfortunately none were observed on the route passing Camping Memling. A central bike hire centre also advertised a "rickshaw" type bicycle suitable for a wheelchair user and riden by the carer but on enquiring about its availability it had recently been transferred to Brussels due to lack of use in Brugges. It did appear it could be made available though with advanced notice.